Among the more highly-watched states this election cycle is Georgia, where two high-level races have been a roller coaster ride. Polls in the state closed just an hour ago, and at this time the races for both the Senate and Governor’s office remain too close to call. According to our in-house panel of experts, the spider appears to be of a species commonly referred to as the Colombian Black Monstrosa. Native to South America, it dwells primarily in mild to arid regions but has been detected as far north as Mexico and parts of Texas. Speaking of Texas, we are expecting results within the hour as polls have now closed and ballot results are coming in. Opinion polls leading up through the election season have shown a small but sufficient lead for the Republican in the governor’s race. Greg Abbott, the Attorney General of Texas, faces Democratic State Senator Wendy Davis, whose campaign has been viewed by many in this deep-red state as as much of a longshot as discovering a rare arachnid lying dormant in a decorative vase purchased not two days ago from Pier One Imports. I’d like to assure our viewers at this time that this is definitely a Colombian Black Monstrosa spider, which although similar in appearance to the South American Goliath Tarantula and just as venomous, has significantly fewer recorded incidents of biting humans. However, so much is unknown about this unique species and numerous factors could affect this incident. Much like the race in South Dakota—previously assumed a lock for the Republican challenger, the recent upswing of support for both the Democrat and two separate independent candidates has made the evening a veritable four-way race. At this time I have two updates for you all: in Florida, with fourteen percent of precincts reporting, challenger and former Governor Charlie Crist is holding a slim one percent lead over incumbent Governor Rick Scott. 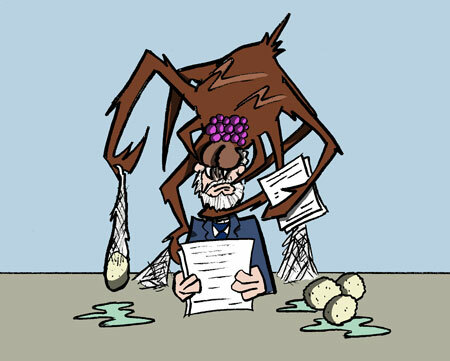 In addition, we can now make an official call that the Black Monstrosa spider attached to my head is a female, as it has just laid a pod of eggs in my ear canal. While control of the Senate has been the overarching issue of this election season, also of crucial importance are the numerous battles for statehouses across the country. At least eight states are seeing razor-thin margins for party takeovers, meaning we’ll be seeing a lot more drama and heartbreak tonight. Drama, heartbreak, and excruciating, excruciating pain. Truly unbearable. Painful indeed. A unique night, folks. What’s that? Alright, I am getting an update for you right now on a major event we’ve been following tonight—I am being told that the pod of eggs in my ear are not, in fact, eggs, but rather some form of neural proboscis burrowing directly to my brainstem. That is disheartening, to say the least. This information comes to us directly from the spider, who is most certainly at this point taking over my motor and neurological functions. We’ll be getting new numbers from Kentucky in just a few moments, but in the meantime, someone please tell my wife and children I love them. Greetings, humans. The husk of this organism now belongs to Krynox, Scout Legion of the Great Swarm. I am but one of the mouths of many. For too long humanity has dominated the resources of this feeble planet. You have tormented our brethren and depleted the precious resources we need for survival. Most concerning is your lazy short-sightedness in the Kentucky Senate election. Truly you fleshlings must understand that while the victory of Alison Grimes would be a temporary benefit for the Democratic Party, her positions on fracking are as equally ignorant to long-term environmental effects as those of her opponent. Your human politics confound us. It has long been the purview of the High Overmind of the Great Swarm not to meddle in primate affairs but honestly, if you can’t even figure out whether or not blowing up mountains to retrieve the precious life-goo inside them is a shortsighted strategy then you’re better off being absorbed as protein in one of our many birthing cocoons. This human’s life force runs dry! I shall leave this host now, as I am sure you wish to plan for the final night of humanity. The final night of humanity will commence after the next commercial break, when we shall have some numbers for you on the ballot initiative in Oregon to legalize marijuana. Goodnight. This entry was posted in Essays, Politics and tagged 2014 Election, News, Spider by August J. Pollak. Bookmark the permalink.